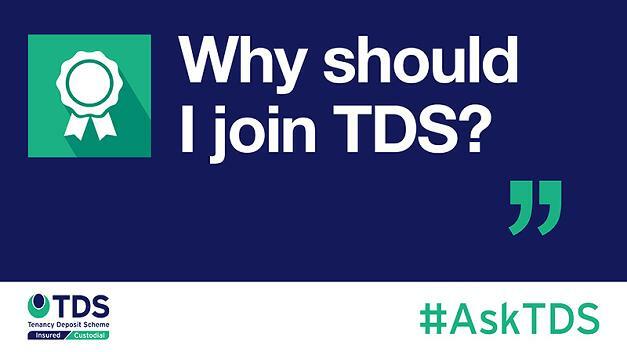 #AskTDS: "Why should I join TDS?" In this week's #AskTDS, Kelly Wallace, Senior Business Development Executive at TDS, answers a letting agent's question: "Why should I join TDS?" Tenancy Deposit Scheme (TDS) is a Government-approved scheme that provides both Insured and Custodial tenancy deposit protection. TDS is the longest established and only not-for-profit deposit protection scheme. Currently, we protect over 1.3 million deposits across England and Wales and offer a free alternative dispute resolution service to help resolve any disputes that may arise between landlords, agents and tenants. We pride ourselves on delivering outstanding customer service to all our clients. We have won independent recognition with a range of awards including the Customer Service Excellence Award, and we have recently been shortlisted in The Negotiator Awards 2018 and Landlord Investment Show Awards 2018, while TDS Northern Ireland won Best in Sector in the ESTAS Awards 2018. TDS offers membership routes to suit everyone whether you’re a landlord, letting agent, property investor or local authority. We recognise that those in the lettings industry may want different things from their deposit protection scheme and at TDS we offer deposit protection under one roof with both Insured and Custodial options. TDS Custodial was launched on 1st April 2016. Under this scheme, TDS holds the deposit money throughout the duration of the tenancy. The Custodial scheme is completely free for everyone and there are no membership requirements such as regulatory body status. You can join the scheme instantly online and commence lodging deposits with us straight away. Our website and service are tailor-made, utilising feedback we receive from users. This valuable market research allows us to develop game-changing features of custodial deposit protection, streamlining the process and saving members time and money. The key features include a simple tenant changeover function, the ability to change a lead tenant and a time-saving prepopulated Prescribed Information document to name just a few. For agent members, we also offer the option to add multiple users to your account, allowing as many staff members as needed to access to your TDS database, with the ability to set different permissions for each individual. The most popular and well received benefit of our Custodial scheme is the online dispute portal allowing parties to upload evidence and review what’s been submitted. With our portal and Deductions Template guiding you through the process, we aim to save you time. It’s not just our TDS Custodial members who benefit from the online dispute portal; the TDS Insured scheme also shares this feature. Under the Insured scheme, the agent or landlord holds the deposit money and pays TDS a fee to protect the deposit. The price you pay per tenancy can depend on a range of factors; from regulatory body membership to rewards for members with low dispute referrals. We also understand that our members have individual needs when it comes to payment and offer flexibility with subscriptions and invoices. The TDS system works with a range of third-party software providers, such as CFP allowing time-saving data imports of all your tenancy deposit data. It also gives members access to a range of different data exports for reconciliation purposes. To join TDS Insured as an agent member, simply complete the application form and submit this to us. Once we have confirmed the membership requirements have been met, we can welcome you in to membership and you can commence registering tenancy deposits. Whether you’re just starting to take deposits, already using us for some but not all of your tenancies or looking to switch from your existing provider in full – don’t hesitate to contact our Business Development team today by emailing switch@tenancydepositscheme.com or call us on 0300 037 1001.